That's why I wanted to make sure you knew about the following four hockey titles. I'm still waiting on review copies, and I should have them by next week. 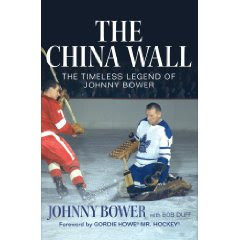 The China Wall: The Timeless Legend of Johnny Bower By Johnny Bower and Bob Duff. As a youngster, Johnny Bowers father told him if he worked hard every day and put passion into his profession, it would pay off in the long run. It was good advice, especially the part about the long run. Bower toiled in hockeys minor leagues for more than a decade, waiting for his chance at the big leagues and it wasnt until he was 33, an age when most players are winding down their careers, that he finally debuted in the NHL. Expected to be a stop-gap measure for the Toronto Maple Leafs, Bower instead became an institution in the city, tending goal for the club for the next 12 seasons, backstopping the Leafs to four Stanley Cups, the last one coming when he was 42-years-old. Bower appeared in four NHL All-Star Games, won two Vezina Trophies, and earned enshrinement to the Hockey Hall of Fame. Bower was 45-years-old when he played his last NHL game on December 10th, 1969, becoming the first player in NHL history eligible to collect his pension while still on the active roster of a league club. Bowers story is more than just a tale of a man who defied Father Time and rated among the greatest puckstoppers of all time. Its about a boy who grew up in the small northern Saskatchewan town of Prince Albert, listening to Foster Hewitts call of Hockey Night in Canada on the radio, dreaming that someday he could emulate Frank Brimsek, the famous Boston Bruins goalie nicknamed Mr. Zero. 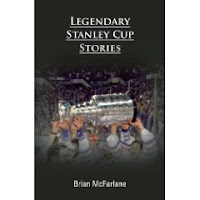 Brian McFarlanes Legendary Stanley Cup Stories is a fun and fascinating collection of some of the most memorable moments from hockeys glory days as seen through the eyes of one of the games most celebrated and respected broadcasters. Brian McFarlane spent his professional career as the face of hockey, calling games and interviewing its many greats. He continues to be one of hockeys most knowledgeable insiders and was credited during his working days as always providing a fair, accurate, and always respectful account of each game, the players, the teams, and its officiating. Through his experiences, he witnessed and was part of many of the most exciting, pivotal, and humourous events of hockeyin particular those which were part of Stanley Cup history. Brian McFarlanes Legendary Stanley Cup Stories, is also unique by what it is not. It is not simply a book of statistics or lists about the Stanley Cup. Nor is it a greatest moments collection told from someone elses memories. It is a first hand, behind the scenes account by a man that lived it. It is McFarlane at his best, doing what he does so well and that is telling candid and colourful stories. Brian was in the backrooms, the dressing rooms, and the boardrooms and has gathered a lifetime of his most enjoyable and interesting moments into this must have volume for all fans of the game. This book is a tribute to the IIHF's 100th anniversary season, 2007-08, which featured the top 100 stories of all-time. In addition, all other important events from the centenary are included, from the 2008 World Championship in Canada to the IIHF's outdoor rink in Zurich, finishing with stories and pictures of the inaugural Victoria Cup game. Before entering the NHL, Dany Heatley followed in his father’s footsteps (Professional hockey player, Murray Heatley) and played hockey at the University of Wisconsin. For Heatley, gaining an education was important and he spent two successful years—both on and off the ice—in college. He was the first draft pick of the Atlanta Thrashers and the second overall pick of the 2000 NHL entry draft, though he completed his second year in Wisconsin before debuting with the Thrashers in the 2001-2002 season where he won the Calder Memorial Trophy for Rookie of the Year. In his second NHL season he scored more than a point a game and finished the year with 89 points in just 77 games. In that same season he was invited to play in the All Star Game where he broke Wayne Gretzky record for the youngest participating player as well, scored four goals tying the scoring the record previously held by Vincent Damphouse, Mike Gartner, Wayne Gretzky and Mario Lemieux. During this time, Heatley continued to represent Canada in international play earning gold at the ’03 and ’04 World Championships and silver in ’05.Heatley began the 2005-06 season with the Ottawa Senators and quickly became a fan favourite by becoming the first player in Senator franchise history to score 50 goals in one season. For the second straight season, Heatley scored 50 goals in 2006-07. He helped lead the Senators to win the Eastern Conference Championship and in to the Stanley Cup finals against the Anaheim Ducks.Most recently in Heatley’s 2007-08 season he was, yet again, asked to play for Canada in the World Championships. For the second time in five years Heatley was awarded MVP and lead the tournament in scoring.Dany is an inspiring player and thrills fans of the game each time he steps on the ice. He is equally as impressive off the ice as a role model to aspiring young athletes. His words are important, candid, and encouraging. He has learned many lessons and in Dominant Dany Heatley, he shares these with his many fans.